Aloe Vera grows WILD in Costa Rica!!! Learn more about what ALL it can help with!! (NaturalNews) Over 6,000 years have passed since the Egyptians referred to the common houseplant Aloe vera as the "plant of immortality," due to its myriad of uses for everything from acne to baldness, insomnia, digestive upsets, sepsis and cancer. Aloe vera plants produce a variety of substances with antibacterial, anti-fungal, anti-viral and antioxidant properties; earning it a spot in the pantheon of superfoods and super herbs alongside companions such as echinacea, garlic, turmeric and ginger. If you intend to take Aloe vera orally, always choose an organic product or grow your own. The plant provides high amounts of vitamins and minerals. Regular consumption of Aloe vera juice supplies the eight essential amino acids not made by the body plus a wide range of enzymes. Please "SHARE" this link with everyone you feel might enjoy it!!! If you're living in Costa Rica you've probably experienced electrical things don't seem to last as long as they "say" or you'd think they would si? I feel part of it could be a combo of reasons - #1 being VERY few buildings in Costa Rica are grounded, plus have you ever sat there and watched you ceiling lights? Notice anything?? MANY places I've been they flicker/dim a bit on and off. This is often caused by old or faulty wiring (which can cost you a LOT of wasted $$$/¢¢¢ each month [case in point my old place where I even replaced ALL the lightbulbs in a 6,000 square foot/6 bedroom home with those new dangerous ones, plus I bought a new Energy Conscious Fridge and I put a timer on my HUGE hot water tank plus I asked guests to give me 1 hour notice before they wanted to take a shower - all #1 so I could show my love for Mother Nature - and save a few dollars - which it barely made a dent - well, the bill after turning the hot water tank off went down $50/month!!]) - or just the inconsistent flow of electricity in Costa Rica. Some people (myself included) feel "they" might send inferior products to Costa Rica (why you might ask? How many Tico's have you noticed to raise hell when something doesn't work [like you do with many Americans]. I REALLY "Got" this when I was helping some American's look for appliances and I couldn't find ANY of the model numbers they were asking for. With LOTS of research, I find most of the models in Costa Rica were the same - just a different number. With more research I found MANY of the products here had less than positive reviews. Hmmmm - 1+1=__????). I'm sharing the hints in this article in hopes of helping YOUR appliances last longer!!! Looking to buy some appliances? Thinking about buying something new? SERIOUSLY consider this point - what appliance, car, lightbulb - heck - any merchandise - have you found these days that is built as well as those from ages ago?? REALLY consider buying something used - even older (even if it's not so pretty) - especially if it has a good history of being more solidly built!!! Whether you bought your home appliance at a local outlet or a big-box retailer, chances are you purchased it with the intent it would last a long time. But just as cars need the occasional oil change and tune up to extend their mileage, your home appliances need some added attention now and again too. Well-maintained appliances use less energy, require fewer repairs, and last longer. And all of these benefits add up to more savings in your pocket. My experience in the appliance industry has taught me you can't stop time, but there are a few things you can do to extend the lifespan of your appliances and keep them running well beyond their warranties. The refrigerator's gaskets (the plastic strip that forms a seal between the fridge and doors) help keep cool air inside the fridge, conserving energy. To help the gaskets stay elastic and form a better seal, periodically wipe them clean, removing all residue and coat them with a thin film of Vaseline. Dirty or dusty refrigerator coils can restrict airflow through the appliance, causing it to overheat and potentially break down. Remove your fridge's kick plate (the front panel near the floor) or reach around the back of the fridge and clean the coils with a handheld vacuum. Like the refrigerator, a faulty gasket can prevent your dishwasher from operating correctly and efficiently. Dirt, cracks, or other buildup on the gasket can cause your dishwasher to leak. I recommend regularly cleaning it with soap and water to keep a watertight seal. When loading your dishwasher, be careful to not damage the racks. The racks are typically coated with a vinyl material that can be damaged from rough use. Dishwasher racks are typically very expensive and often rival the cost of a new appliance, so keeping them in good shape can prevent another unwanted bill. The #1 useful tip for your washing machine is ... Don't overload the washing machine! Yes, it really can be that simple. Clothes need to be able to move freely during a wash cycle. If the machine is jammed full of clothes, it will need more energy to move them around. This means added strain on the washer's motor, transmission, belts, and other parts. That being said, it's also very important to not under-load the machine. Small loads can lead to off-balance cycles, which put a strain on the drive components. Plus, small loads waste water and energy, since there is very little difference in the amount of energy and water used for a full load and small load. Like the washing machine, it's important to not overload the clothes dryer. A large load places increased strain on the appliance as it struggles to effectively dry the clothing. Also be aware of your dry time. 35 minutes is typically plenty of time to dry your clothes (in a well functioning dryer), compared to the 60 minutes dryers are usually set for. Reducing dry time saves energy and decreases the strain put on your dryer, as well as your clothes. If your dryer has an auto-dry setting, use it. Auto-dry heats only as much air as necessary and will reduce energy use. It's also important to regularly monitor the dryer's external vent cap -- located outside your home -- for a buildup of lint and dust. Debris prevents the cap from operating normally and reduces airflow, potentially causing premature failure of the motor and thermostats. Plus, it's a potential fire hazard. Finally, for all major appliances, it's advisable to fix minor problems before they become a bigger issue and affect other components. Unusual leaks and noises should be investigated as they occur to help minimize the cost of maintaining your appliances and prolong their lifespan. Need an APPLIANCE REPAIR person in Costa Rica? 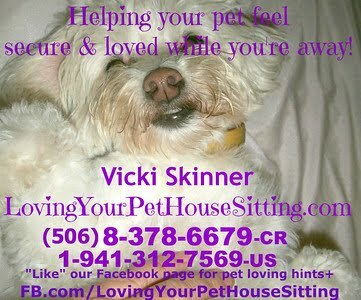 Check out this site - and tell them Vicki from the blog/website sent you!!! I think many people that have driven outside of Costa Rica (especially in countries where driving is more civilized) will agree that Costa Rica is not one of the easiest/best countries to drive in (especially with all the motorcyclists that seem to have a Death Wish!!). I think one point that REALLY contributes to that is there is NO formal Drivers Training required (sadly, that's been one of the program's that's been cut in U.S. schools as well [it's MUCH more important to learn history and things right?? - NOT!!!]) and many people are being taught by people (usually their parents I'm sure) that never had education on how to drive properly either. ESPECIALLY because in Costa Rica one MUST learn how to drive DEFENSIVELY! ESPECIALLY with all the Unmarked one-way streets, potholes, missing manhole covers, motorcyclists passing around you when you're in the left turning lane WITH your blinkers on+++!! San Jose - Paso Ancho (driving and written test) • Uruca (driver's license) • Limon • San Ramon • Alajuela • Puntarenas (close to Jaco) • Liberia. WHAT'S THE LEGAL AGE FOR DRIVING IN COSTA RICA?? Anyone JUST 13+ years old can take the Written Test (WTH?? Does anyone understand what this is about??) - BUT - they can NOT get their Drivers Permit till they're 17 years old and they can not get their Drivers License till they're at least 18 years old!!!! HOW LONG IS A LEARNER'S PERMIT GOOD FOR? HOW LONG IS A DRIVER'S LICENSE GOOD FOR? The one I got is good for 3 years which I didn't realize it until AFTER the new law (below) took effect. Since my new license in Florida was good for 10 years, I never dreamed my license here would be good for just 3 years so I missed renewing it before the new law went into effect - GRRRRR!! ACTIVE VALID Residency or Nationals. Have your Residency "Pending" - proof/papers and all? SORRY - but as of now, you can NOT get a Costa Rican Drivers License! you MUST have a Costa Rican Drivers License if you're in the country more than 90 days!!! Yet if you're in "Residency Pending" status, according to Immigrations, you don't "NEED" to leave Costa Rica every 90 days. BUT - the way the new law is, if you're in Costa Rica for over 90 days and you get stopped for a ticket by the Transito Policia - or just a random check - the FINE is 280,000 colones/about $565 U.S. dollars) and six (6) points on a yet UNreceived license - for EACH occurrence!!! Via Conference/Video call on Skype.com (you MUST have Skype Version 5.10 or more recent). Do you have a group of friends that would like to take one of these class? You can get•create your own group together and even host it at your house. Inquire for prices. Group Classes are the cheaper alternative (4 people minimum [so it may take a few week to get together]) plus they tend to take longer since you're waiting to answer everyone else's questions) - OR - you can create CUSTOMIZE one-on-one classes JUST for you!!! Classes here are taught in English and/or Spanish but note that the Written Test Exam with COSEVI.com (the equivalent to our U.S. "DMV" [Department of Motor Vehicles]) are in SPANISH•Español. When you go to COSEVI to take your written test, you'll get one of 7 different tests each with 40 questions. This course will focus on studying/memorizing each of these tests - so if you have a good memory (SOOO NOT me!!) yet don't know a lot of Spanish, you could do pretty well as they study each test on the computer (as you would at COSEVI - so at least a basic understanding on how to use a computer will be VERY helpful!!). is for people that already have a drivers license (customized for your needs). WHO IS THIS FOR? It's really for the person that has been driving for ages BUT, the thought of driving in Costa Rica scares the hell out of you! This class is customized for YOUR Needs!! This class is geared towards a specific thing you need help with - like how to drive in the city, defensive driving, parking lots. (with driving done in parking lots)! I DON'T SPEAK MUCH SPANISH SO I'M NERVOUS ABOUT DOING THIS MYSELF! You can also HIRE them to take you to COSEVI to do the Tests as well as help walk you through/translate for the Drivers License process. EXECUTIVE DRIVERS and BODY GUARDS. The cars they use for Drivers Training classes have Double-brakes and Double Mirrors (they're one of the few companies that has this double brake system). They can come to you/pick you up wherever. Their GUARANTEE: If you fail the test you can retake the class one more time. Do you know of any other Driving Schools in Costa Rica - ESPECIALLY in English - or in Español? PLEASE "SHARE" this link with everyone you feel can use this information! The play features two 'step' sisters; when the play opens we find them confronted by life changing opportunities/challenges. One sister, the younger has the opportunity to realise a deeply held dream to become a writer by being offered a half scholarship to study with a famous writer and teacher. The elder sister finds a lump in her breast. The two women travel their paths together even though they live on opposite sides of the continent. In the process they realise and heal old wounds and come to new understandings. The dialogue is witty and fast paced, and the action, which spans three years, never drags. We see the women also deal with the incidental characters, doctors and clients, teachers and fellow students, who affect their lives and their decisions. The pony in the title refers to the fable of two children who always look for the bright side of any situation. In a roomful of manure they can be found looking for the pony! Looking for the Pony by Andrea Lepcio was first presented in a "Rolling World Premiere" Off-Broadway at Vital Theatre Company in New York City in 2009. Since then it has been performed across the United States always receiving excellent reviews. Described by reviewer Martin Denton as a “wise, gorgeous and moving play”, it tells the story of two smart loving women and the (sometimes metaphorical) places they go during three impossible years in which one of them battles cancer, while the other shifts from a well-paying career in finance to her true vocation as a writer. It is a tale of two life journeys, characterized by hope and fear and pain and passion. (Martin Denton review 2009). This production, directed by Annette Hallett, will showcase the talents of two young women, Silvia Schneegans and Bethany Skipper as Eloise and Bethany. 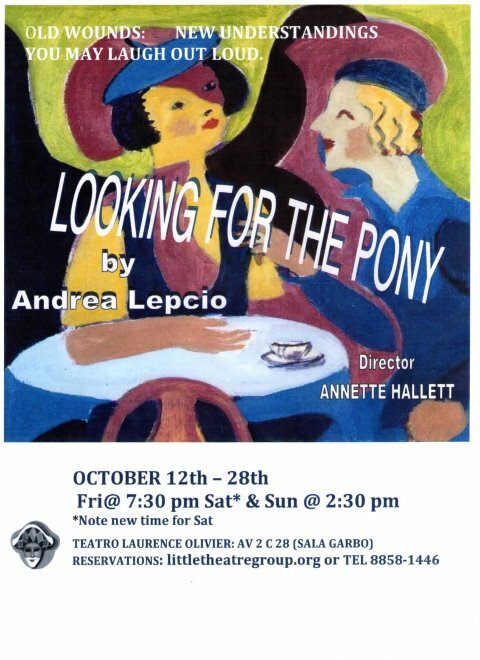 Everyone else in Looking for the Pony— doctors, nurses, cancer patients, rabbis, etc.—will be portrayed by a small team of dedicated actors who will change costume and personality throughout the play with remarkable agility. Come to this play prepared to laugh and to maybe cry a little; either way, do not forget your tissues! The Tico Times NEEDS Your Help!! The Tico Times - TicoTimes.net - printed it's last PRINT publication Sept. 28, 2012 - but they will continue their ONLINE publication (I've been subscribing to it for awhile - I KNOW it's making Mother Nature happier!!) - BUT - they NEED your help to keep even that going!!! They NEED to raise $10,000 within the next 32 days so can you help??? Even just $5 - whatEVER you can gift to keep this CR Icon going that has been serving the English-speaking community of Costa Rica since 1956!!! COMMENT: Since there is a LONG history of such signs being stolen to cash in for scrap metal - might it not have been more efficient to simply paint the street names on the corner of all the buildings??? Has anyone started "pools" on how long before they start disappearing?? The fair aims to create opportunities for dialogue among beekeepers and consumers of high quality bee products, as well as raising awareness of the importance of bees and honey benefits to human health. You will be able to taste and buy honey and other bee products from man different Costa Rican beekeepers. 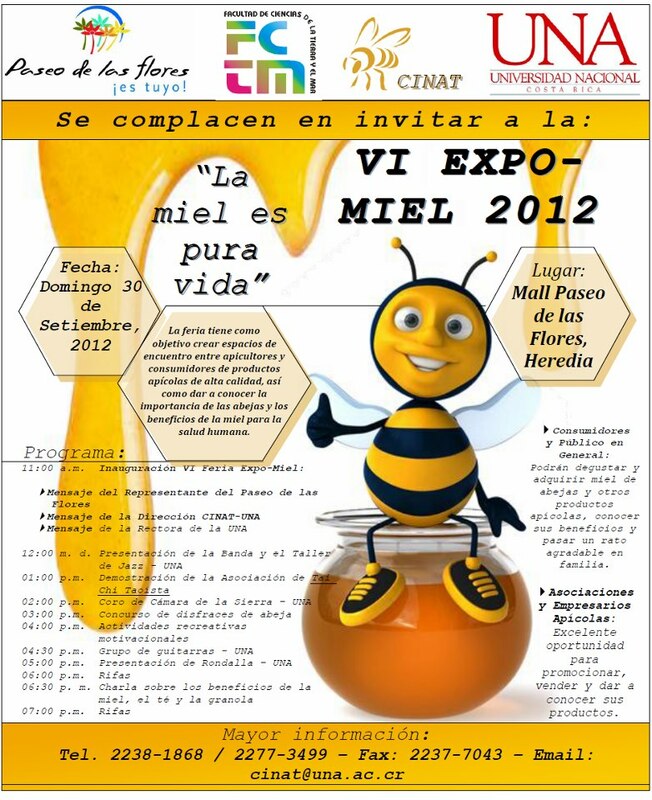 There will be live music, a bee costume competition, and a raffle for various honey bee products. Mike and his wife will be pouring samples and selling bottle of our Mead, honey wine that we have made from honey from for their own hives. It is truly delicious!! Francisco is SEEKING to BUY a KEYBOARD in Costa Rica. If you know of anything, email me at LivingLifeInCostaRica@gmail.com and I'll Connect you! LA RUTA DE LOS CONQUISTADORES is Costa Rica’s premier mountain bike race and one of the most difficult athletic events on the planet. The world’s original multi-day fat-tire stage race, La Ruta is the “Grandfather” that created and inspired this now-worldwide genre — and still the most loved, feared, and respected. Every year, hundreds of the very best mountain bikers and endurance racers from around the world come to Central America to test themselves in this unique odyssey of distance, geography, climate and culture. La Ruta, the only bike race that traverses the American land mass from coast to coast — from Pacific to Atlantic —is no easy day at the beach. Between its sea-level start and finish, the 161-mile route crosses 5 mountain ranges that force you climb a cumulative 29,000 feet! The daunting terrain is so harsh that half a century ago it took Spanish conquistadores led by Juan De Cavallón took 20 years to cross the land of Costa Rica from the Pacific to the Caribbean Sea; today, following almost the same trails they blazed, modern-day explorers racing on mountain bikes will do it in 3 days. But the legendary difficulty of La Ruta is just one reason why this adventure will take your breath away. Its setting is one of the most special places on earth. Costa Rica has been called “the most biodiverse place on the planet” by National Geographic because it packs a full 5% of the Earth’s species of birds, plants and animals onto just 0.01% of the planet’s land mass. La Ruta riders get a chance to see and hear many of them as they travel through nine of the country’s twelve different microclimates. As the route snakes through tropical rain forest, 12,000 feet volcanoes, banana plantations and tiny farm towns, it alternatively drenches you in rain and freezes you in high elevation. Over every imaginable riding surface— singletrack and fireroad trails, gravel, hard-packed dirt, pavement, thigh-deep mud, sand, volcano ash, and more — the route will have you making endless granny-gear chugs, hike-a-bikes, and white-knuckle descents through and over rain forests, sweltering jungle, steaming volcanoes, breezy coastline, suspended bridges and deep river gorges. Be forewarned: La Ruta It is not a race for novice mountain bikers. Even professional riders often roll their eyes in disbelief when they recount what they have done. This race is a test of everything you’ve got — your riding abilities, physical endurance, mental strength and equipment durability. In this struggle of joyful adversity, you may even learn something new about yourself. That’s why many who experience the grueling terrain that bedeviled the original Conquisadores nearly five centuries ago often describe it not merely as a “race” — but as personal growth journey. Important Notice: The views and opinions shared within this news article are those of the writer and do not necessarily represent those of The Costa Rica Star news network. If you have any feedback or questions pertaining to this article, please use the contact form at the top of the website to get in touch with our editors. LA RUTA DE LOS CONQUISTADORES es el principal de Costa Rica, carrera de bicicletas de montaña y uno de los eventos deportivos más difíciles del planeta. El mundo original de varios días de grasa neumático carrera por etapas, La Ruta es el "abuelo" que ha creado e inspirado en este género, ahora todo el mundo - y sigue siendo el más amado, temido y respetado. Cada año, cientos de los mejores ciclistas de montaña y los corredores de resistencia muy de todo el mundo vienen a Centroamérica para ponerse a prueba en esta odisea único de la distancia, la geografía, el clima y la cultura. La Ruta, la carrera ciclista sólo que atraviesa la masa de tierra estadounidense de costa a costa - del Pacífico al Atlántico-no es un día fácil en la playa. Entre su nivel del mar salida y la llegada, la ruta 161-millas cruza cinco cadenas de montañas que obligan a subir un acumulado de 29.000 pies! El terreno es de enormes proporciones tan duras que hace medio siglo tuvo conquistadores españoles encabezados por Juan De Cavallón tardó 20 años en cruzar la tierra de Costa Rica desde el Pacífico hasta el Mar Caribe, y hoy, después de casi los mismos senderos que ardían, hoy en carreras días exploradores en bicicleta de montaña lo hará en 3 días. Pero la dificultad legendaria de La Ruta es una de las razones por qué esta aventura te lleva tu aliento. Su entorno es uno de los lugares más especiales del mundo. Costa Rica ha sido llamado "el lugar más biodiverso del planeta" por National Geographic, ya que los paquetes de un total de 5% de las especies de la Tierra de pájaros, plantas y animales en sólo un 0,01% de la masa terrestre del planeta. La Ruta pilotos tienen la oportunidad de ver y escuchar a muchos de ellos a medida que viajan a través de nueve de las doce diferentes microclimas del país. En cuanto a las serpientes ruta a través del bosque tropical lluvioso, 12.000 pies volcanes, plantaciones de banano y pueblos pequeños agricultores, que alternativamente le empapa la lluvia se congela y usted en alta elevación. Sobre cada superficie imaginable caballo-singletrack y senderos fireroad, suciedad grava apisonada, pavimento, barro muslo de profundidad, arena, ceniza volcán, y más - la ruta tendrá que crear un sinfín de abuelita de engranajes resopla, caminata-a-bikes y blanco-nudillo descensos a través y sobre los bosques tropicales, selvas, volcanes humeantes sofocante, una costa ventosa, puentes suspendidos y profundos desfiladeros fluviales. Esté prevenido: La Ruta Es no es una carrera para ciclistas de montaña novatos. Incluso los pilotos profesionales a menudo ponen los ojos con incredulidad cuando hacen un recuento de lo que han hecho. Esta carrera es una prueba de todo lo que tiene - sus habilidades de conducción, resistencia física, fuerza mental y la durabilidad del equipo. En esta lucha a la adversidad alegre, incluso se puede aprender algo nuevo acerca de ti mismo. Es por eso que muchos de los que experimentan el terreno plagado agotador que los originales Conquisadores hace casi cinco siglos a menudo lo describen no sólo como una "raza" - sino como camino de crecimiento personal. Aviso Importante: Las ideas y opiniones compartidas dentro de este reportaje son las del autor y no necesariamente representan las de la red de Costa Rica noticias Estrella. Si tiene algún comentario o preguntas relacionadas con este artículo, por favor, utilice el formulario de contacto en la parte superior de la página web para ponerse en contacto con nuestros editores. LOCACION • LOCATION: Calle principal frente a la Municipalidad Costado Norte del Parque central de Escazú • the MAIN STREET DIRECTLY IN FRONT of the Municipalidad - on the North side of the park in Centro Escazu. plus they have Kiddie Pools usually year around and pool toys!!! I think they have them pretty much year round. WHEN'S THE BEST TIME TO FIND THESE ITEMS? around the beginning of December (JUST before kiddies get off for their "Summer" break and it gets HOT in Costa Rica - till after around Samana Sante/Easter). Next time I get to those places, I'll get more details and price ranges. KIDDIE POOLS or ABOVE GROUND POOLS? Attendees also can register résumés online. 30 companies in finance, technology, food and supermarket industries, as well as recruiting agencies, will hold a job fair over the next 2 weekends on the campuses of Universidad Latina. Companies are seeking to hire some 2,000 people. The fair will be held Sept. 28-29 at the university’s San José campus and Oct. 5-6 at the Heredia campus, from 10 a.m.-6 p.m. Among companies seeking to hire are: Hewlett Packard, First Data, Deloitte, Convergis, Amba Research, Young 360, My Profile and Auxis. Of the 2,000 positions available, 800 are jobs with tourism companies, and 15 hotel companies will be recruiting, including: Four Seasons, Marriott, Intercontinental, Hilton, Westin, Holiday Inn, Barcelo, Villas Playa Sámara, Flamingo Beach Resort, Wyndham, Park Inn and Hyatt. In addition to presenting résumés at individual company booths, attendees can use a digital system to post them online. University employees also will offer training lectures on topics such as résumé preparation and preparing for a job interview. Más de 30 empresas de tecnología, hotelería, entidades financieras y de servicios se darán cita en los campus de San Pedro y Heredia. Feria Virtual se suma a las posibilidades de conseguir empleo para aquellas personas que no pueden asistir a los campus. En Costa Rica el 47.6% de la población pertenece a la fuerza laboral del país, pero un 10.4% de este grupo se encuentra desempleado. Esto según datos del Instituto Nacional de Estadísticas y Censos, INEC. En contraparte, una encuesta realizada por la empresa Manpower indica que un 23% de los empleadores costarricenses incrementará su planilla entre octubre y diciembre.Visualizando esta realidad laboral y con el objetivo de acercar a las empresas con sus futuros empleados, la Universidad Latina organiza una feria de empleo en su campus San Pedro y otra en el campus Heredia. La feria de empleo que se realizará en el campus de la Universidad Latina en Heredia incluirá en su menú 800 plazas vacantes en más de 15 hoteles del país. “El objetivo de incluir hotelería en la feria es brindar la oportunidad de poder obtener mejores oportunidades laborales dentro de la industria de la hospitalidad y a la vez reforzar el acercamiento de la Universidad hacia las diferentes empresas del ámbito hotelero y de restaurantes” menciona Sánchez. Entre los hoteles que participarán se incluyen el Four Seasons, Costa Rica Marriott, Intercontinental, Doubletree by Hilton Central Pacific, Doubletree by Hilton San José, Hotel Westin Playa Conchal, Holiday Inn Escazú, Hotel Barceló San José Palacio, JW Marriott Tamarindo, Villas Playa Sámara, Flamingo Beach Resort, Wyndham Escazú, Park Inn San José y Hyatt. “Con estas ferias de empleo buscamos mantener una relación de cooperación entre la universidad, las personas desempleadas y la industria”, comenta Ariel Sánchez, Director de Vida Universitaria de la Universidad Latina. Las dos ferias de empleo que organiza la Universidad Latina ofrecerán alrededor de 2000 puestos de trabajo y reunirán a más de 30 empresas. Entidades financieras, empresas de tecnología, hoteles, restaurantes, supermercados y agencias reclutadoras serán parte de la oferta que ofrecerá estas ferias. Estarán presentes Hewlett Packard, Resources, First Data, Deloitte, Search, Convergis, Amba Research, Joven 360, My Profile, Auxis, entre otras. Cada una de estas empresas estará reclutando empleados para puestos administrativos y operativos en diferentes niveles jerárquicos. “A parte de los stands de cada empresa, los asistentes podrán contar con una plataforma digital donde las empresas subirán sus ofertas de empleo en la web y podrán registrarse para aplicar a los puestos desde internet. Con esta novedad desarrollaremos una feria de empleo virtual, en paralelo”, explica Sánchez. El año pasado la Universidad Latina recibió a más de 3000 personas en las ferias de empleo que organizó y reunió aproximadamente a 30 empresas que ofrecieron más de 1500 puestos administrativos y operativos en el área de finanzas, ventas, contabilidad, ingeniería industrial, tecnologías de información, recepción, alimentos y bebidas, entre otros. Este año, durante las ferias de empleo de la Universidad Latina se ofrecerán charlas, con el propósito de capacitar a las personas que andan en buscan de trabajo, para que puedan cumplir su objetivo con mayor rapidez. “Una de las grandes ventajas de esta oportunidad es la presencia de nuevas cadenas hoteleras que están en proceso de apertura en Costa Rica para los meses de noviembre 2012 a 2013”, resalta Sánchez. Estas oportunidades para encontrar trabajo están disponibles para el público en general y se llevarán a cabo el viernes 28 y Sábado 29 de Setiembre en el campus de la Universidad Latina en San Pedro y el Viernes 5 y Sábado 6 de Octubre en el campus Heredia. Los Viernes las ferias de empleo estarán abiertas al público de 10am-6pm y los Sábados de 10am-4pm. More than 30 technology companies, hotels, financial institutions and services will meet at the campus of San Pedro and Heredia.Virtual Fair joins the employment prospects for those who can not attend the campus.In Costa Rica, 47.6% of the population belongs to the country's workforce, but 10.4% of this group are unemployed. This according to the National Institute of Statistics and Censuses, INEC.In contrast, a survey by Manpower shows that 23% of Costa Rican employers increase your return from October diciembre.Visualizando this labor situation with the aim of bringing companies with prospective employees, the University organizes America job fair in San Pedro campus and another campus in Heredia.Seats world renowned hotels are the highlight in Heredia CampusThe job fair to be held on the campus of American University in Heredia on their menu include 800 vacancies in more than 15 hotels in the country. "The purpose of including hospitality at the fair is to provide the opportunity to get better job opportunities in the hospitality industry while strengthening the University's approach to the different companies in the field of hotel and restaurants" says Sanchez.Among the participating hotels include the"With these job fairs seek to maintain a cooperative relationship between the university, the unemployed and the industry," says Ariel Sanchez, Director of Campus Life at the University America.The two job fairs organized by the American University will offer about 2,000 jobs and will bring together more than 30 companies.Financial institutions, technology companies, hotels, restaurants, supermarkets and recruiting agencies are part of the tender offer these fairs. Hewlett Packard will be present, Resources, First Data, Deloitte, Search, Convergis, Amba Research, Young 360, My Profile, Auxis, among others.Each of these companies will be recruiting employees for administrative and operating at different hierarchical levels. "A part of the stands of each company, attendees will have a digital platform where companies will raise their jobs on the web and can register to apply for the posts from internet. With this new develop a virtual job fair, in parallel, "says Sanchez.Last year American University welcomed more than 3,000 people in job fairs organized and brought together around 30 companies that offered more than 1,500 administrative and operating in the area of ​​finance, sales, accounting, engineering, information technology , reception, food and beverage, among others. "Job fairs have become an effective tool to achieve positive outcomes for businesses and who complete many job vacancies and with very good candidates or human resources," says SanchezThis year for job fairs American University will offer talks, with the aim of empowering people who walk in looking for work, so they can accomplish their goal faster.The talks are free, open to the general public and do not need to make a registration in advance. Those interested in only some of the issues to be submitted to the time and date indicated below:"One of the great advantages of this opportunity is the presence of new hotel chains are in the process of opening in Costa Rica for the months of November 2012-2013," highlights Sánchez.These opportunities to find work are available to the general public and will be held on Friday 28 and Saturday 29 September at the American University campus in San Pedro and Friday 5 and Saturday 6 October at the Heredia campus.Friday's job fairs are open to the public from 10am-6pm and Saturday 10am-4pm. King size Air Mattresses for $24+. I bought some little 2 person Pup Tents ages ago for under $10! Walmart carries many things year-round. Moderate prices. What ideas do YOU HAVE on where to find Camping Equipment? 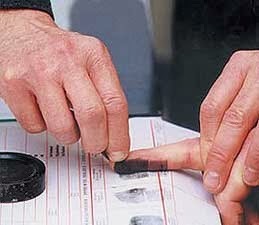 FingerPrinting - "Comprobante de Huellas"
MUST be done IN Costa Rica and IN PERSON by the applicant. Once your fingerprints have been done, it's then run through Interpol. Monday through Friday - from 7am-3pm. Once you enter the property, there's a PHOTOGRAPHER immediately to the LEFT of the gate who will take the required photos for 2,000-c.
one of yourself facing front and one of each side. See the note below on where to get the pictures taken as if it were ME, I'd wait till I got THERE to do it so I KNEW it was EXACTLY what they wanted!!). The Fingerprint Office is to the LEFT, along a covered passage. There's a big sign saying "Huellas"
(FingerPrints [funny - translate.google says FOOTprints!]). Hand your passport and other documents to the clerk, then wait in line with everyone else until your name is called. (he wasn't sure if they had an appointment as his lawyer took care of everything and even brought them. CHECK YOUR STATUS - Is your Costa Rican Residency Pending? Want to check your status?? Click here for how to do it YOURSELF - for FREE!!! FREE Worldwide Heirloom Seed SWAP!!!! !